We eat leftover cake and ice cream because it was Avital's birthday this week. Monique's wife is eight months pregnant and she's serving me dessert, which suddenly feels so backwards. Their North Hollywood apartment feels cozy and quaint, like a refuge in the valley. We laugh and chat and look at pictures of Monique from what feels like another life. I marvel at her long, thick hair and adorable bangs. She tells me stories of the dresses her mom sewed ("She was really into bibs") and her favorite pin that she wore every day. Unlike some interviews, Monique and I have been friends for a long time. She has remained one of my favorite people to have a long, informed conversation with about important issues such as race, equity and justice. I've long admired her courage and I continue to learn from her every day. A few years ago, I came to Monique with a question that sat heavy in my heart. "I'm white. I am a person with certain privileges. What is my role in fighting for the rights of others even though I can't identify with certain struggles?" That day, I began to understand that privilege is a gift -- not a burden that I have the luxury of feeling guilty about. I learned it's my responsibility (and the responsibility of any person with privilege) to be aware and to exercise it in every opportunity you have it to lift up and support others — to be an ally that stands behind others with your actions and hands the microphone over instead of speaking for or on behalf of. It is equity and it takes all of us. There's a woman named Yolanda Davis-Overstreet who grew up in the Mid-City West Adams neighborhood here in Los Angeles. She's in her 60s now. Her mother is also in the temporary wheat-paste mural we put up under the 10 freeway to reclaim that space for the community. My awesome friend Christian Mendez helped me put it up because the pictures are so big that it's actually a lot of work. When I created this mural, I asked for as much permission as Caltrans asked to build this freeway. Which is zero. This was part of a day that was planned very intentionally in conjunction with several other people to experiment with storytelling. Collaborators included Dr. Adonia Lugo, Yolanda, Vera Lugo, Dr. Sarah McCullough, Yolanda and myself. The planning process is important to uplift because it was done with the community at the table and with thought partners who share similar values and each bring different assets to the table to do this process justice. After the mural went up, I gave a general planning history of the neighborhood before she told her own personal narrative of growing up there. She told her story in in four parts, and after each part there was a vocalist who asked the group of us to develop one line of lyrics for what we just heard and then add body percussions to it. We were singing it together -- maybe 15 people -- under the freeway underpass with the wheat paste mural. We could have just said, "Okay, here is a powerpoint on how planning impacts your neighborhood," but instead we intentionally did it through one person's individual narrative. The freeway's presence tells its own story, but how do we have that structure not be the only story told and superimpose the narrative that goes unseen? That's what we were doing. It was meaningful and beautiful to reclaim this space that they had lost and are continually impacted by. I can give you the traditional response about why freeways through neighborhoods isn't good -- it's bad for your health, air quality, etc. But from a justice lens it's deeper than that. It disconnects people. In the 1930s the federal government came up with a color-coded map which led to housing segregation. If you wanted to purchase a home as any skin color other than white, you couldn't purchase in certain neighborhoods based on this map. This is why you have environmental justice communities today -- because where people of color could purchase a home, even if you had money, was only in these particular government-regulated zones. During the Great Depression, white people in this particular neighborhood who owned big homes started to liquidate their assets. The deeds to their homes would say, "No negroes can live here," but they ended up selling homes to people of color who wanted to live in better areas. That's how this became an upper-middle class or wealthy black community in the late 30s, 40s and 50s. By the late 40s, this neighborhood has about 50 black families who owned homes. The white families that still lived there actually took them all the way to the Supreme Court saying that they had purchased homes illegally -- basing it on the red-lining maps and the deeds. The Supreme Court ruled in 1948 that actually you cannot segregate housing like that, and if you have the money to purchase you can purchase. Newspaper articles ran with people of color saying, "You mean we can live anywhere?" Then you go back and look at the original freeway plans for the region. In the late 30s, the maps weren't definitively drawn for freeways. By the mid fifties, the freeway plans were redrawn. So the answer is, no you can't live anywhere. Even though the Supreme Court ruled you can, you can't. No matter how hard you work. This is discrimination. This is environmental racism, and this is not by accident. At the time, freeways were state of the art planning. It was considered cutting edge and innovative -- but for who? When this happened, the people in the neighborhood were never consulted and never listened to -- not just with freeways but with anything. And it's particularly people of color that are ignored and seen as not having the solutions to their own neighborhoods. For myself, planning is not innovative if it displaces people. It's not innovative if it puts a burden on one group of people over another. It's not innovative if it repeats these patterns of injustices. And it's not innovative if the community wasn't consulted in a genuine way. Often times agencies want to hire community based organizations or planning firms to do education to the community about safe walking, biking or driving. But they need to understand and realize that education is a two-way street and there is a respectful way to do this. Education is not education unless the teacher also learns from the student. People know what they need. You can be extremely smart, but when you’re hearing from folks in the community about what’s needed you need to truly learn from them as well. Additionally, we need to know in advance what the agency plans to do with that really treasured information and have a response to the community. We need to be able to say, "Thank you for sharing this very valuable information about your neighborhood. This is how we intend to honor what you said and use what you've told us." And then follow through on that. People know what they want and they have a vision of the kind of life they want. Often times people do not have the tools or the vernacular to express what that is. What I want to do with Pueblo Planning is not have to teach them the planning tools, but reverse it -- identify the tools people are innately familiar with and allow them to play with those tools to create the communities they want. There are two tools I think are incredibly powerful that come naturally: story telling and making art. What I hope to do in my work is facilitate a space (I see myself as a facilitator rather than an expert) where people can use tools they naturally have to share their vision of what they want. Then, how do I do my due diligence in listening and being humble to that knowledge and really internalize that and then go back and look at planning codes and precedents and policies and best practices? How do I apply planning language to what they've described so that policy makers can understand what was said? How do I share that back to the community and say, "Did I hear you right?" Ideally, I'd like to live in a world in which my role would not be needed - a world where this is just common practice. A lot work is treated as transactional. "I need you to go do something. You go do it. You get your money." But i very much operate relationally rather than transactionally, and that's how I want to run my business. So it's important to me that we have a good relationship, and community-based work is all relationship based. It's hard for a relational person to operate in a transactional world. I think for myself, that's one of the biggest challenges. I'm meeting more people, especially young people of color, that are starting their own businesses in a variety of fields, not just planning, that are trying to honor this process. I think there is, or maybe always has been, a generation of folks that have seen what planning has done to their communities and are trying to figure out how to these tools or flip the script on what has been done and reclaim our neighborhoods. That's really the reason I went to planning school -- not because I wanted to work at a city but because I wanted to be a better advocate. I knew I had to understand policy to be a good advocate, but I didn't understand the right hand of policy is planning. I didn't even know it was a field until I was doing advocacy on different air quality issues and I became exposed to planning. I think having a supportive partner is a really important part of resiliency and maintaining balance. But I don't know that I'm resilient. It's more just that I don't feel like there's another pathway or option -- this is just who I am. There are moments where I'm not resilient, and I think it's okay to think, "Well I'm not very resilient today." I think at times people of color are exploited for their knowledge. I'm happy to share my expertise about x, y and z but is it paid? Would you pay a white consultant? I've recently learned to set more boundaries, so I think I'm being better about what I'll give away for free -- and if I do give it away for free it's more a matter of equity. If a person of color brings up a situation, having a white ally validate them is big in those spaces. That's a real simple of example of how that solidarity can happen. But there's no manual on how to be. I think a lot of it stems from my own experience and from a place of empathy. I've felt what it feels like to be hit by a car. I've felt what it feels like to be displaced from your home. I now have a better understanding of how my personal narrative was tied to planning and policy -- which I didn't understand until years and years later. 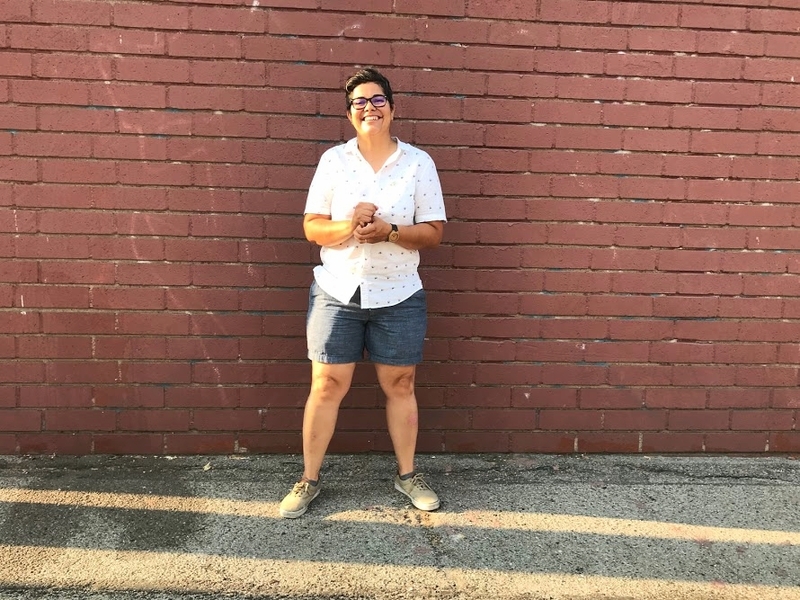 I learned how planning and policy impacted me walking across the street and how those things impacted really pivotal moments in my development as a human and moments in my ability to stay connected within one community or not. The stories that people are experiencing in their own lives is being forged by these outside forces whether they know it to be or not. And that's an issue of justice. So for me, this work comes with a deep sense of empathy but at the same time, I also acknowledge my own privilege in that space. I acknowledge the privilege my education has allowed me, that my marriage has allowed me -- just being at the table with someone high up in city government allows me. That's privilege. And so the question is - what am I going to do with that privilege?